The name Okinawa somehow brings me back to war stories, particularly the Japanese takeover in the country following the outbreak of WWII. Trying to figure out why the Okinawa pearl milk tea is named as such, I came across an article about Okinawa taking pride in its brown sugar industry. Not your ordinary brown sugar, but high-quality, made from vitamin and mineral enriched sugarcane — a significant aspect of the Okinawan culture and history, dating back to the 17th century. Not sure if the brown sugar in the drink is Okinawan, but it definitely gives the milk tea a rich, deep flavor, making it more exciting than the vanilla-laced Nagoya milk tea, and at par, yet distinctively different from the caramel-infused Hokkaido Milk Tea. Absorbing the full-bodied taste inspired by Okinawa, the tapioca pearls were a delight. 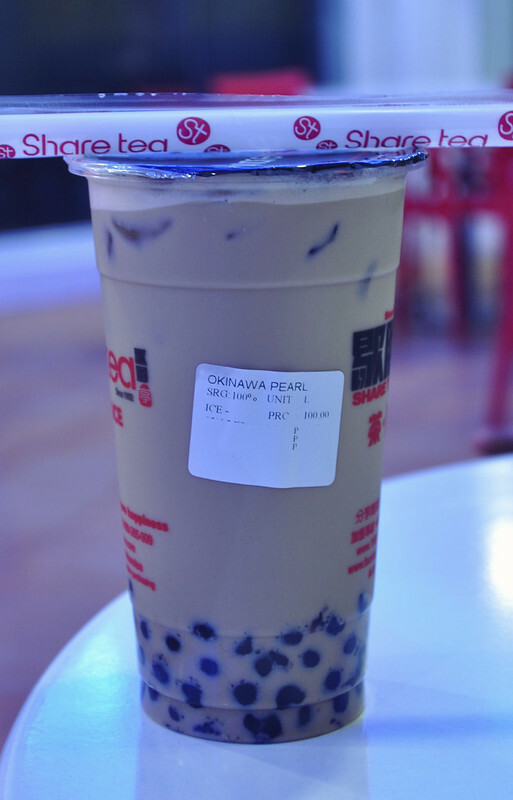 Let bygones be bygones, I welcome the Okinawa pearl milk tea with all my heart. Barioishii! ← Tacos del Norte teaser and Cheesecake Etc.